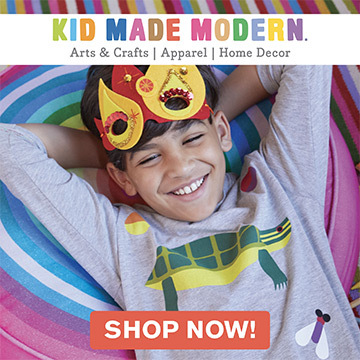 We LOVE practicing new skills with our kids, and there’s no question that this includes sewing! 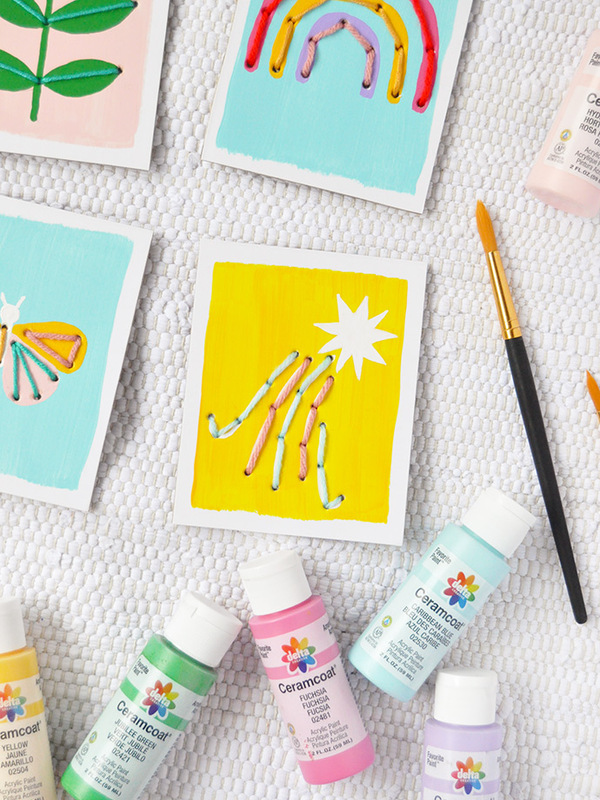 Of course, we’ve long relied on stitch cards to help with this process and over the years have shared some super fun printable projects here on the blog. 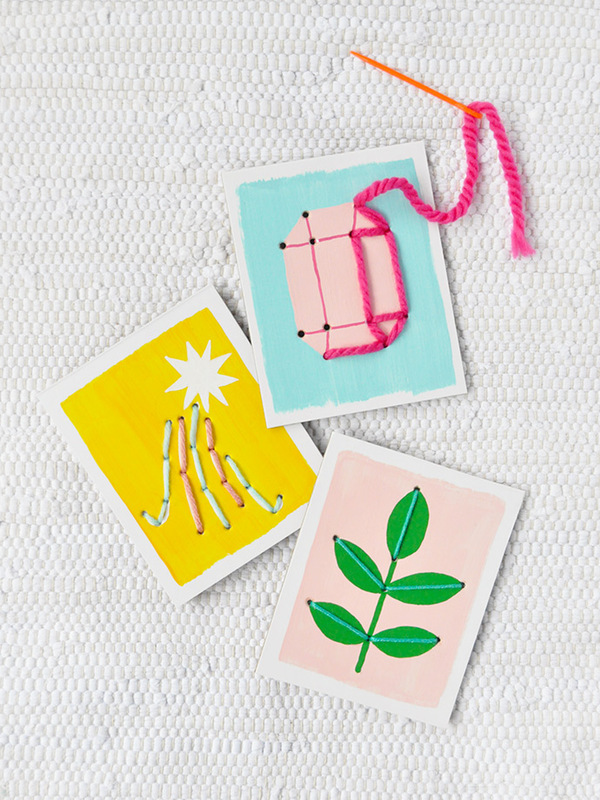 Today we’re over the moon to be making our very own custom stitch cards, and you can too! 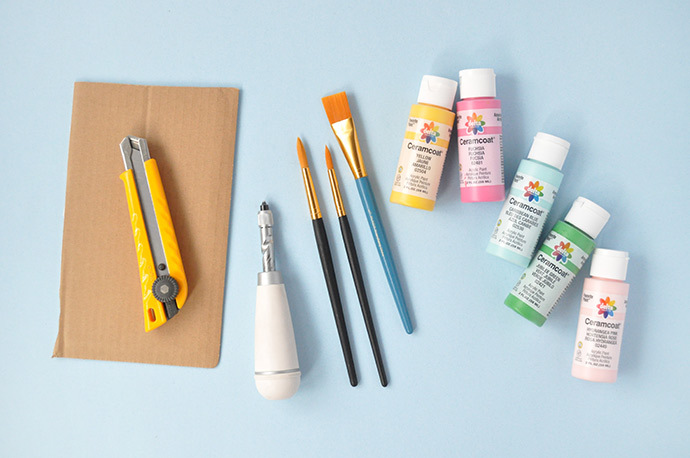 Grab some recycled cardboard and your favorite colors of Delta Ceramcoat® Acrylic Paint and get crafting! 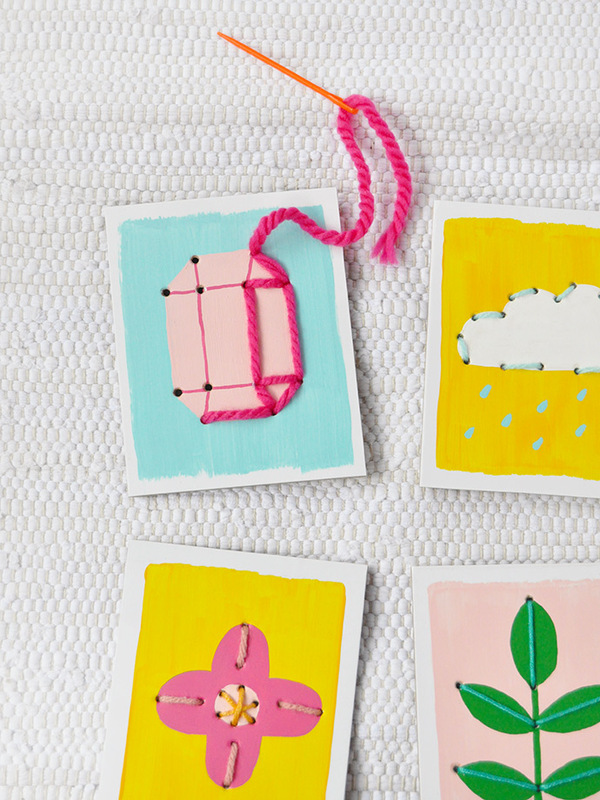 We kept our stitch cards nice and small, but you can absolutely make them as big or little as you want. 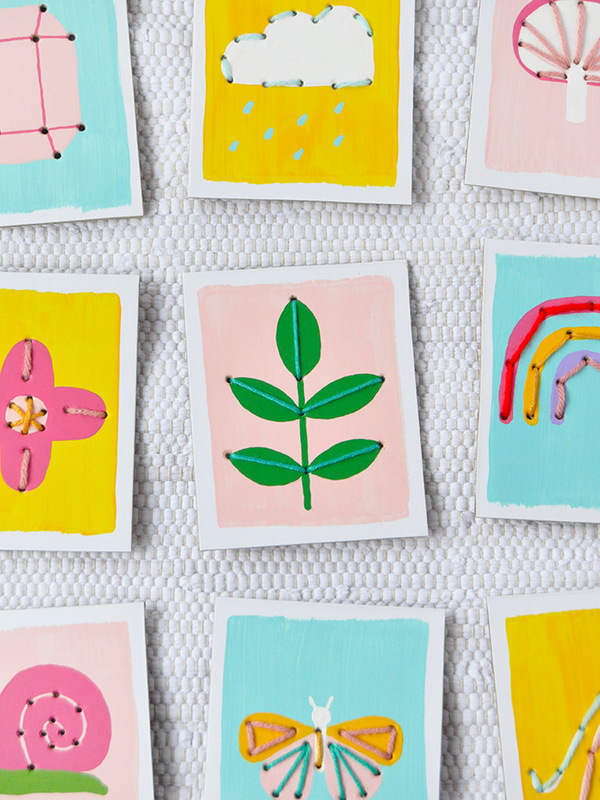 What if you painted a whole scene on some cardboard and turned that into a giant stitch card? Talk about cool kid-made art to display! 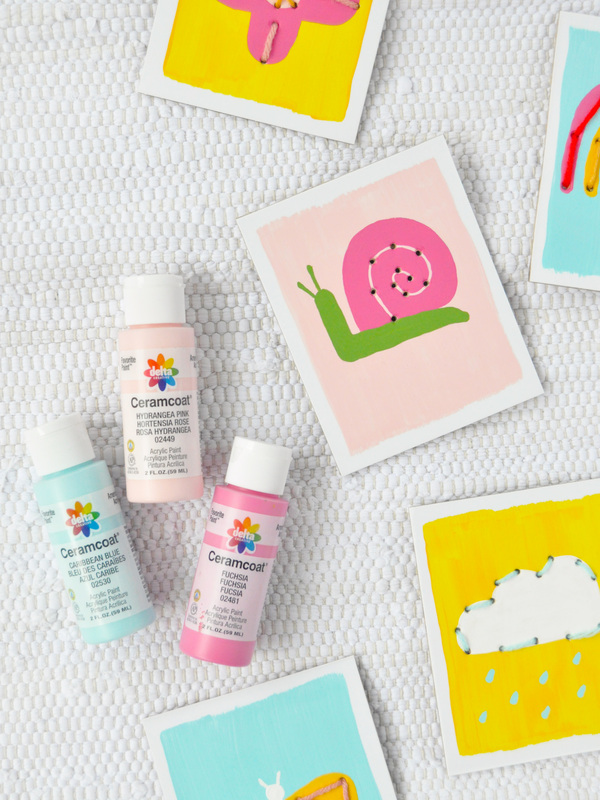 We loved using all these bright and fun colors to create these adorable cards – you can find all 22 shades and 6 brand new Flash Metallic colors in the craft aisle at Target! Start off by cutting your cardboard into postcard sized rectangles. The cardboard we were using was already white on one side, so we used that as a starting point. If you also want a white surface, you can give each rectangle a quick coat of white paint at this stage too. Next we applied a coat of paint to add a pop of color. 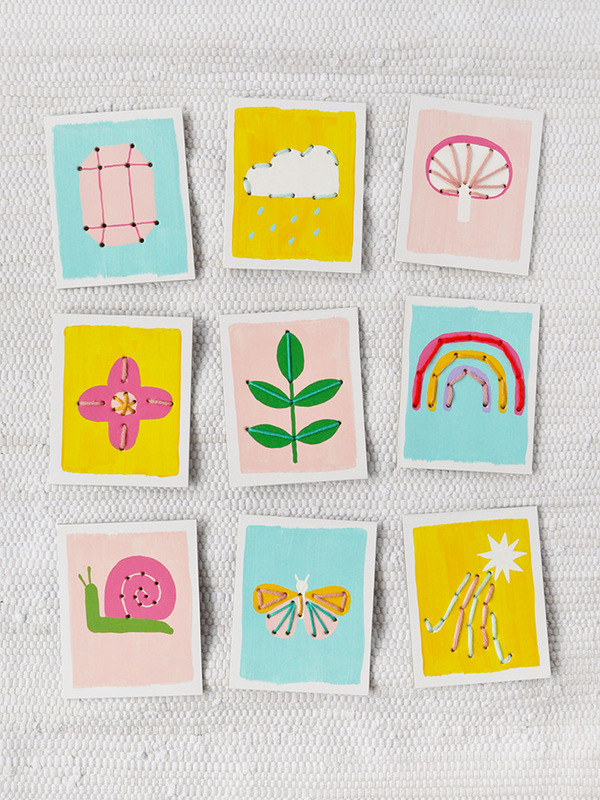 On all of the 9 stitch card we made, we used 3 colors as the base coat on all of them so that they’d have a cohesive look. Let dry. 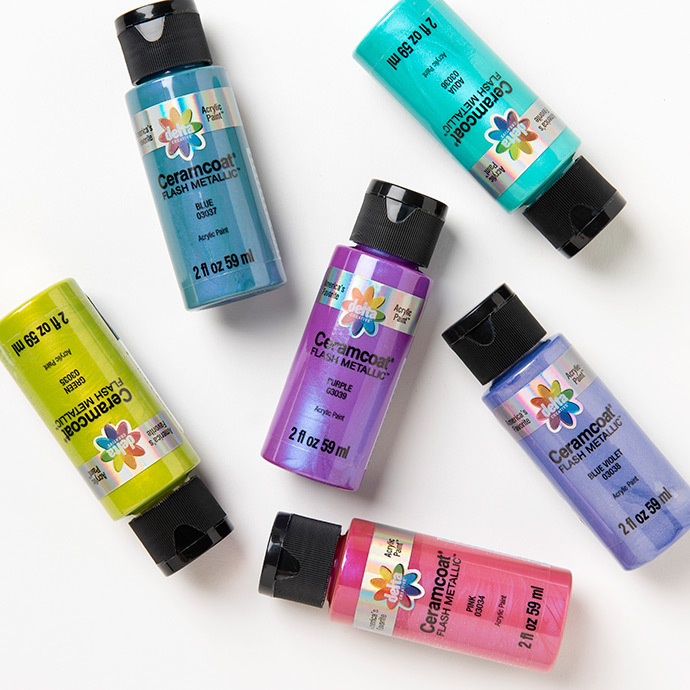 Now it’s time to get creative! Paint whatever you like onto the cardboard rectangles – we were inspired by a bunch of shapes from nature including leaves, flowers, snails, clouds, etc. 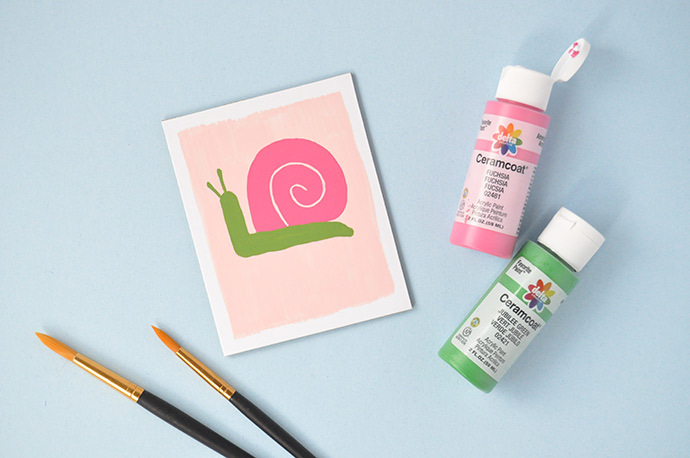 You can seriously paint anything you and your little ones like! One thing to keep in mind is where you’d like to add the stitch details later. Curved details are a little harder to work with, so geometric shapes are a great place to start. Let dry. Use a screw punch to make holes in the cardboard, following the lines of your design. 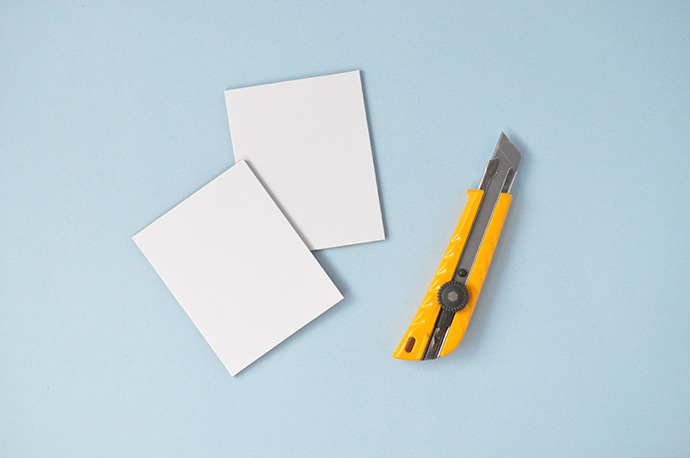 If you don’t have a screw punch, you might be able to use a regular hole punch depending on your design, or a large nail and hammer being sure to make the holes on a scrap of wood. 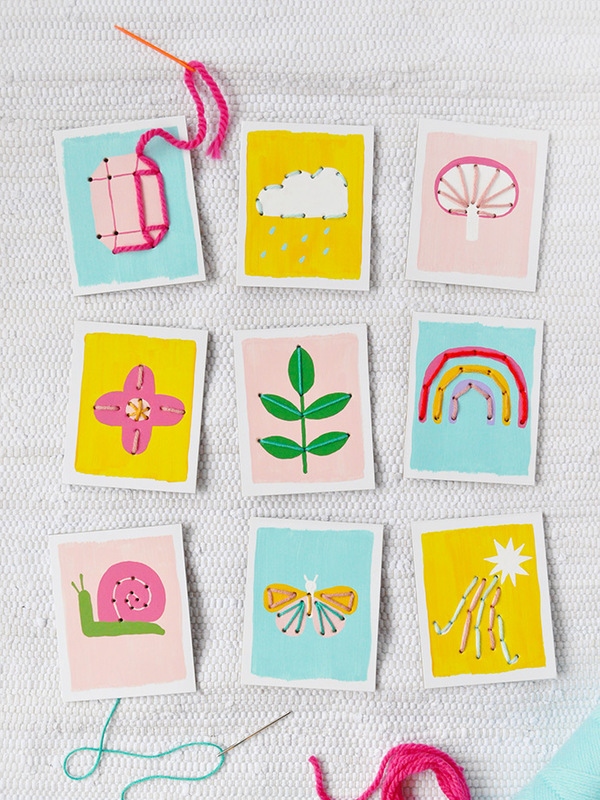 And now you have a whole collection of fun stitch cards for your kids to practice on! 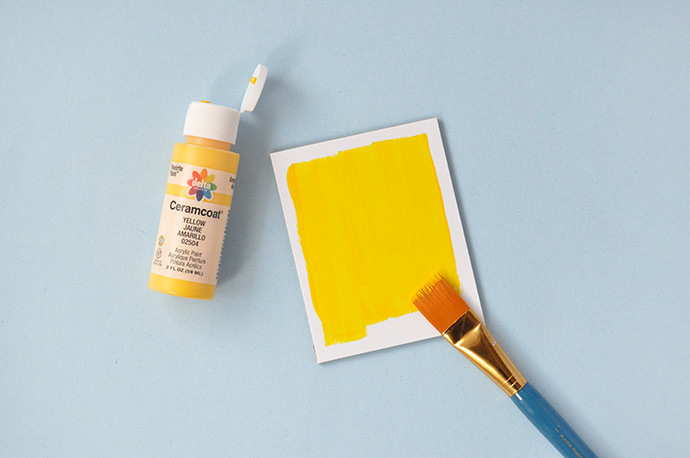 Find all 22 shades of Delta Ceramcoat® Acrylic Paint at your local Target along with the six new Flash Metallic shades in the craft aisle or at Target.com. 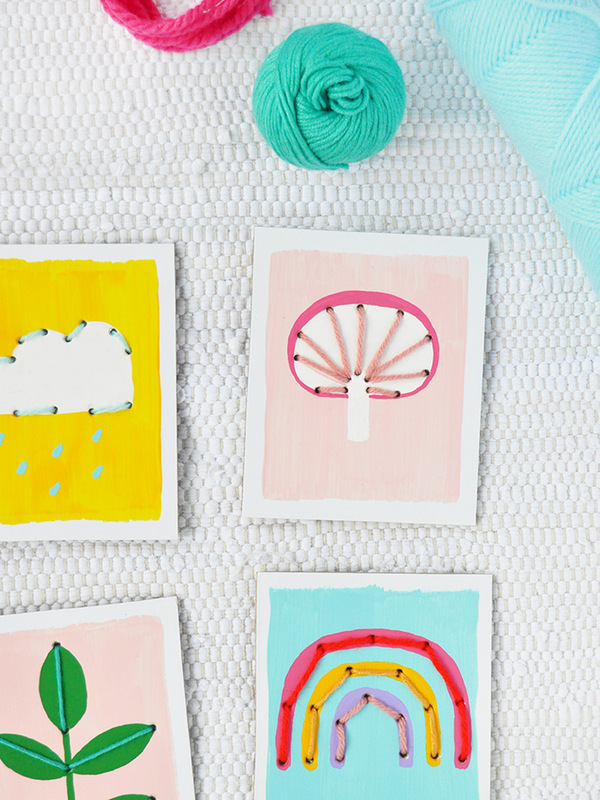 It would be so cute to add some metallic details onto these stitch cards, don’t you think? The gem especially would look great in metallic! Keep in the loop about all of Plaid’s new products and DIYs – follow them on Instagram, Pinterest, Facebook, and YouTube. 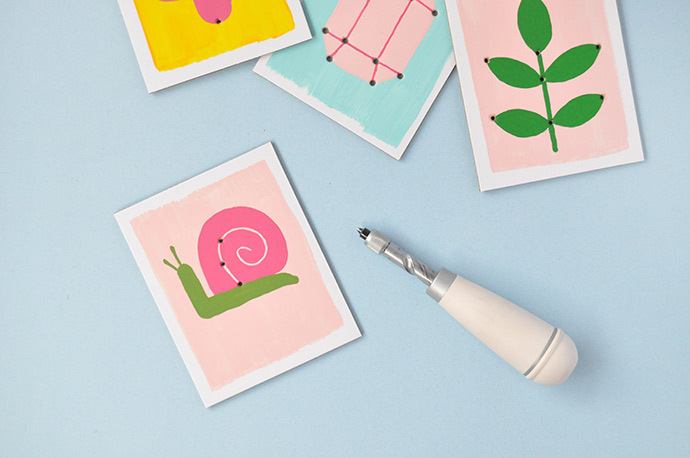 These stitch cards are so cute! I’m looking forward to using things like this with my toddler when she’s just a bit older!